Poker Ride provides the perfect combination of skill and luck, to bring players a thrilling gaming option – with the added bonus of a progressive jackpot that grows in record time, thanks to the high regard of this game. Poker Ride is very similar to "Let it Ride" and is played with a single deck of 52 cards, which is automatically shuffled before the start of each game. The aim of Poker Ride, which is played against the dealer, is to come out of the game with the best hand. The dealer and the player are dealt two cards each, after which the player needs to either call or raise. At this point, the player can also choose to take out the optional side bet. 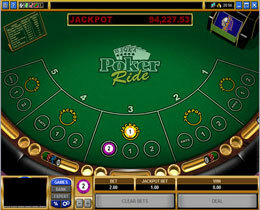 The side bet is one of the most thrilling features of Poker Ride. Set at a basic 1 credit this side bet puts players in line to win huge amounts. Although it is an optional side bet, not many players decline the opportunity to invest such a little amount in order to win so much money. As a result, the jackpot grows each time it is added to, until one lucky player walks away with all the cash! Winning the progressive jackpot requires that the player get a Royal Flush in their poker hand. This will automatically award the player with the full amount of the progressive jackpot. However, this is not an ‘all or nothing’ type of jackpot, and there are other ways to win at least some of the jackpot.